The average price is $300,000 but you can expect to pay as much as $450,000 for a large, fully renovated or restored character home. One of the “hottest” neighbourhoods in the Halifax/Dartmouth Area, Old Dartmouth is defined by single family homes and over/under duplexes that are historic or approaching “historic home” status. Most of the homes were built between 1880 and 1920. There are also a number of “infill” homes built from 1930 until the present day. Old Dartmouth begins just south of the Brightwood Golf Club at Thistle Street and extends southward down the hill past the “flower and tree streets” (such as Rose and Pine Streets) to the downtown core centred around Portland Street and the harbourfront. 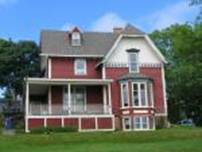 In this area you will find a remarkable variety of historic architecture from Second Empire Victorians with their distinctive mansard roofs to early twentieth century Arts and Crafts (Craftsman) style homes. Tree lined streets and harbour/city views give this neighbourhood its distinctive flavour. Crichton Park ( AvP $310,000) is a newer community (most homes were built in the 60’s and 70’s), bounded by Lake Banook and Old Dartmouth and shares the all community amenities of Old Dartmouth. Bright wood (AvP $251,000) refers to the area bounded by Old Dartmouth, Victoria Road and the Brightwood Golf Club. Convenient location offering bungalows and modest 2 story homes known as Webby Homes because they were built by the Whebby family in the 50’s and 60’s. History: In 1750, the ship Alderny arrived with 151 immigrants. The Council at Halifax decided that these new arrivals should be settled on the other side of Halifax Harbour, in an area known to the Mi’kmaq as “Boonamoogwaddy” or Tomcod Ground. The community was later given the English name of Dartmouth in honour of William Legge, the first Earl of Dartmouth and a former nobleman in the court of Queen Anne. Old Dartmouth served as a centre for manufacturing and shipping for most of its history. When New England Quakers set up a whaling station, Dartmouth was the base. When the shipping magnate Cunard launched steel ships, the Dartmouth Ferry was his test vessel. A heritage walk through Old Dartmouth is the best way to be become acquainted with this wonderful neighbourhood. Visit http://www.visitors.halifax.ca/dartmouth-heritage.shtml for a detailed route and historical anecdotes. Parks and Recreation: There are many parks and green spaces for the enjoyment of the local community. The Dartmouth Common overlooks Halifax Harbour and the city and features a running track, a baseball diamond and even a community garden. Birch Cove Beach, on the Crichton Park/Old Dartmouth boundary offers a supervised, sand beach and a superb view of the many paddlers and rowers from the boat clubs on the shores of Lake Banook. There is also Sullivan’s Pond (simply called The Duck Pond by the locals), the old Starr Manufacturing site and many small play parks scattered throughout the community. Schools: Sought after public schools such as Creighton Park Elementary, Dartmouth High, and Prince Andrew High. Here is a link (click here) to an excellent tool which tells you which schools your children will attend based on the address where they are living. Private schools include Churchill Academy, and Kinderville Montessori. Amenities: The Dartmouth Sportsplex, just below the Dartmouth Common, featuring two swimming pools, an ice rink and state-of-the-art gym facilities has become a popular community centre and Alderney Landing on the Harbourfront with a large public library, a theatre that is home to the acclaimed Eastern Front Theatre Company, a weekend Farmers’ Market, the Ferry Terminal and even a marina has become a popular destination for many others from Old Dartmouth and beyond. For more information on the fascinating history of Old Dartmouth and surrounding area visit their website by clicking this link. Getting Around: While one of the main transportation features is the unique and wonderful Ferry, Metro Transit also offers very good regular bus service. Click this link for schedules and route information on the Metro Transit website. Charm, convenience, family friendly atmosphere, tons of amenities, close to the Eastern Shore beaches and experiencing tremendous development, Old Dartmouth is great choice.